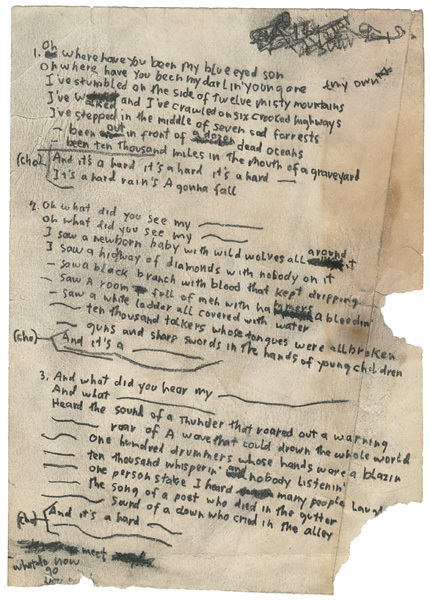 From the pen of Bob Dylan, circa 1963, these are the poet-singer's handwritten working lyrics to "A Hard Rain's A-Gonna Fall". Written here are the first three stanzas of the song, with cross-outs and lines signifying repeated words. Dylan wrote these lyrics on 8.5" x 6" stationery. Although the paper bears two significant tears in two places, has a long crease and is stained, the handwritten lyrics, in black ink, are in excellent condition - strong and fully legible. This is an incredible rock and roll artifact showing the working of Dylan's mind as he worked out the lyrics to this classic song. These lyrics were given to Dylan's long-time friend Peter McKenzie by Dylan's first manager Kevin Crown and come with a letter from McKenzie. 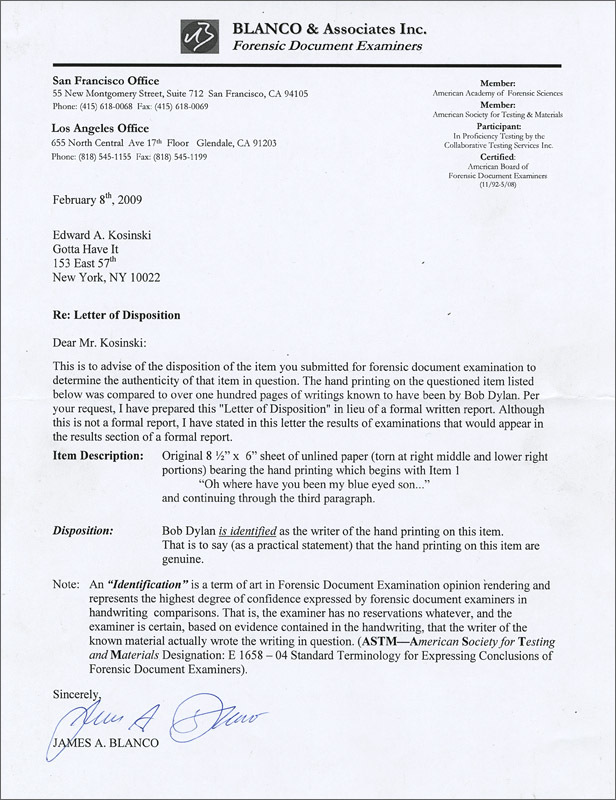 Also accompanied by a signed and dated letter from forensic document examiner James A. Blanco. Estimate: $30,000 - $40,000. PLEASE NOTE THIS DESCRIPTION WAS AMENDED FROM THE ONE THAT APPEARS IN THE CATALOG. Auction closed on Thursday, August 6, 2009.